Carbide Milling Head Speed: 30-90 mtr./min. Make - LEES-BRADNER (USA)Model - HHMachine No: 62Capacity - 16" X 144"This is a Extra Heavy Duty Spline and Thread Milling and this Machine is the 62nd of the 75 Machines Built in the World. We are reckoned names in the industry, delivering a wide range of Thread Milling Machine that have high strength and ensure smooth installation. They are durable in nature and have high strength. Our entire product range is technically advanced and is manufactured with accuracy. Thread Milling Machine are quality assured. Milling Head Motor: 2 HP Min./Max. In order to fulfill the diverse needs of our clients, we are manufacturing and supplying a qualitative array of CNC Thread Milling Machine. - Used in industries like construction, fertilizers, etc. 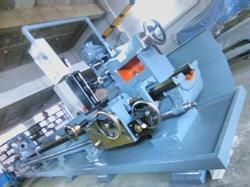 Lambert 124 worm & screw milling machine. Excellent condition. Our rich industry experience in this domain helped us to offer a broad range of Used Thread Milling Machine for our reputed clients.